I have recently renewed an interest in Princess Charlotte of Wales, daughter of the Prince and Princess of Wales, the infamous Prinny and his unloved wife Caroline. This daughter of the egregious couple showed enormous promise. Despite a neglected upbringing, she was bright, personable and intelligent. The newspapers of the day have fewer notices of her presence in her early years than I would have expected. Even her birth was less acclaimed than I thought it might be. The heir to the throne was named Charlotte Augusta. Her parents were already estranged, and her difficult father did his best to keep mother and daughter apart. She lived alone with nurses and governesses almost from the beginning. And yet she carried out royal duties; the earliest reported in the newspapers was in 1799. Her grandfather and grandmother, King George III and Queen Charlotte, and her maiden aunts, were the best constants in her young life. She was not completely without contact with her mother even when Charlotte was away from London at the seaside. 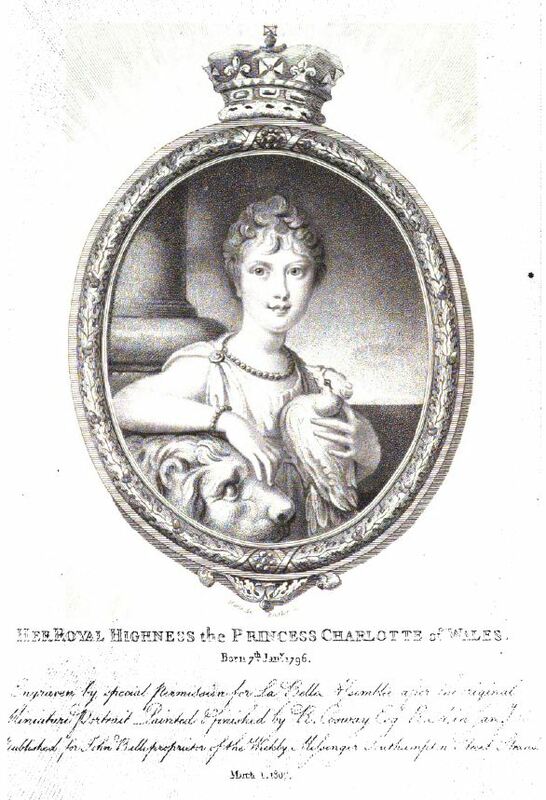 And when the Prince of Wales was ill, someone was looking out for Charlotte's interests as he never did. What must have been the highlight of her earliest years took place in the Christmas season of 1802 and was reported on January 5, 1803. I find two things notable about this article's comments. One is that the Princess of Wales was not invited to the party. And the other is that the 'young ladies' wore pantaloons with their frocks! In 1805, just after Charlotte's ninth birthday, her household changed. It was only one of many changes that occurred over her lifetime as the fickle Prince, her father, tried to tighten his control and his mastery of his wife and his heir. In the following years, Princess Charlotte was a footnote in the news at family birthdays, and frequently socialized with her grandparents. I can imagine eleven year old Charlotte's delight about the pretty dress noted above. (The newspapers printed copious notes about the gowns of the royals at the birthday parties of the sovereigns.) Even La Belle Assemblee celebrated the Princess in 1807. Finally, in 1809, Charlotte's own birthday was celebrated in something approaching the style to which an heir to the throne of England was surely entitled. It must be noted however that the party was not held in a palace nor was it hosted by the child's parents. It was not even held in London. The occasion stands as a monument to Charlotte's strange and difficult upbringing. She was not without supporters though--she was highly regarded as the great hope of the nation by the people of England. And she had family who truly loved her, among them her favourite uncle, her mother's brother, the Duke of Brunswick. Next month, I'll consider what the newspapers print about the last eight years of the short, difficult life of Princess Charlotte.